Consider this: there has not been a new Sly Cooper game since 2005. A year before PlayStation 3 hit the market, developer Sucker Punch released Sly 3: Honor Among Thieves on PS2, and then the studio moved on to the Infamous series, was purchased outright by Sony and seemed to have left its old mascot behind. But that did not stop a green, eager developer from attempting what, to many, would be completely unthinkable. 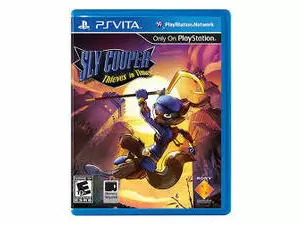 Sly Cooper: Thieves in TimeÂ (also sometimes known asÂ Sly 4) is the fourth title of theÂ Sly CooperÂ series ofÂ platformÂ stealthÂ video games.Thieves in TimeÂ is available on theÂ PlayStation 3Â andÂ PlayStation Vita. [1Though the original series was developed byÂ Sucker Punch Productionsfor theÂ PlayStation 2, this game was developed byÂ Sanzaru Games, who had previously ported the original games intoÂ high-definition versions for the PlayStation 3. The game was teased in these versions, but it was not formally announced until several months later at the 2011Â Electronic Entertainment ExpoÂ during Sony's presentation on June 6, 2011. Disclaimer : Sly Cooper Theives in Time price in Pakistan is updated on daily basis and rate/price for Sly Cooper Theives in Time is valid for all cities of Pakistan included Islamabad, Rawalpindi, Lahore, Karachi, Faisalabad, Peshawar, Sialkot, Quetta etc. Sly Cooper Theives in Time price depends on many factors thats include the price of dollors, manufacturar price and import cost and duties etc. Our team entered specs from diffrent resources and not responsible for any typo error in specs for Sly Cooper Theives in Time, please report any such error in bug report panel for Sly Cooper Theives in Time. Sly Cooper Theives in Time price in Pakistan.